In the early to mid 1900's the land where the Modus Operandi brewery now stands was owned by a gentleman named Edward Hallstrom. He was a noted philanthropist, which earned him a knighthood, and devoted much of his attention towards Sydney’s Taronga Zoo, using his land to grow feed and raise animals – amongst them a pair of white rhinos. 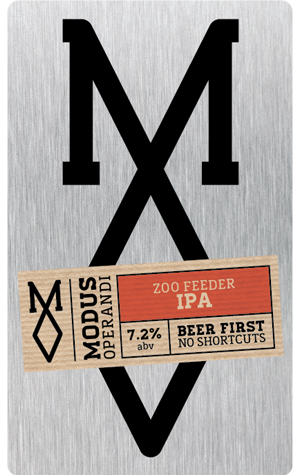 As homage to this history, the team at Modus decided to name one of their flagship beers after him, the Zoo Feeder. The beer somewhat named in his honour is a beautifully balanced medley of IPA styles. Massively hoppy thanks to loads of US and Australian hops, it’s actually built on an English style IPA that’s had some Americanisation in that the malt profile is bigger and bolder. That and more hops. MO's original brewer DJ McCready is pretty critical when it comes to his own beer and we hear Zoo Feeder was one of only two Modus beers he’d took an immediate liking to. Some of the country’s finest beer judges agreed, naming it Australia’s Best IPA at the inaugural CBIA awards in 2014 and again in 2015. So, all things considered, chances are you’ll like it too. That said, it was retired from the core range towards the end of 2016 meaning you'll have to be quick when it does get an occasional rerelease.